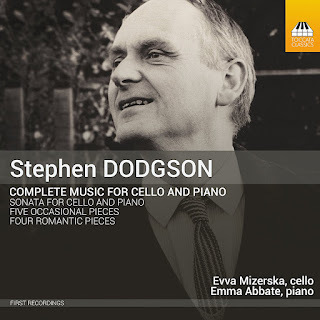 This admirable disc from Toccata Classics is volume one of a project to record the late Stephen Dodgson's chamber music. This disc contains the complete music for cello and piano played by Evva Mizerska and Emma Abbate. And whilst there is a Sonata for cello and piano, the earliest work on the disc, two thirds of the disc is taken up with pieces whose titles sound occasional but whose musical content definitely is not; Two Romantic Piece (Set A and Set B), and Five Occasional Pieces. 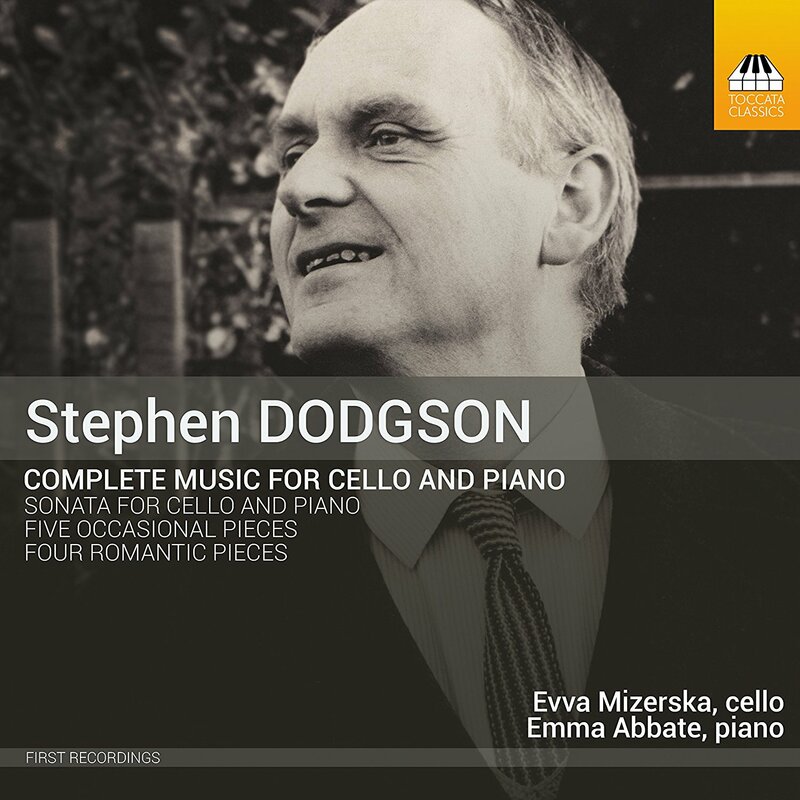 Dodgson seems to have enjoyed writing chamber music, there are over 250 works in his catalogue and he seems to have been drawn to the cello partly through the vocal quality of the instrument. The disc opens with Two Romantic Pieces (Set A) written in 1996, 'Capriccioso' and 'Poco Lento'. The first is dramatic and lively with some capricious moments and a certain baroque feel (Dodgson was drawn to pre-classical forms). 'Poco Lento' is soulful, but with some spiky harmonies and an interesting sense of dialogue between the two instruments. The 1969 Sonata for cello and piano opens with a movement marked 'Con anima', which is vigorous and attractively rhythmic. The middle 'Largo e sostenuto' starts out with a soulful cello solo and the piano eventually joins to create some striking dialogues leading to intense moments with much rhythmic interest. The final 'Allegretto con moto' is complex and thoughtful with a sense of emotional narrative, and some hints of Shostakovich. This work is large scale and complex and though named a sonata, John Warrack's excellent booklet article elucidates Dodgson's equivocal attitude to sonata form. Two Romantic Pieces (Set B) dates from twelve years after the first set. 'Vivace' is restlessly busy yet thoughtful too with imaginative piano writing making it much more than just an accompanying instrument, something which is notable in much of the music on the disc. 'Moderato flessibile' is quiet yet not simple, with cello and piano interacting with each in a different emotional mode. Five Occasional Pieces was written in 1970 for the cellist Thomas Igloi who premiered the piece with pianist Michael Freyhan. 'Prelude' is lyric yet restless, before becoming more impassioned. 'Dialogue' has the feeling of lyrical arioso from the cello with more dramatic responses from the piano. 'All burlesca' is highly rhythmic and not a bit sardonic, 'Aria' is thoughtful and melancholy with a lovely singing line from the cello over a delicate piano texture. Finally 'Alla pola' is vigorously strenuous with hints of popular melody. The music in this disc is complex yet approachable, always with a spicy twist to the harmony. I found the musical language rather reminiscent of that of Kenneth Leighton (Leighton was born in 1929, Dodgson in 1924) with the combination of melodic fragments and toughness.